Hamnet record for transcribed copy. A YORKSHIRE Tragedy. Not so New as Lamentable and true. Acted by his Maiesties Players at the Globe. AT LONDON Printed by R. B. for Thomas Pauier and are to bee sold at his shop on Cornhill, neere to the exchange. 1608. 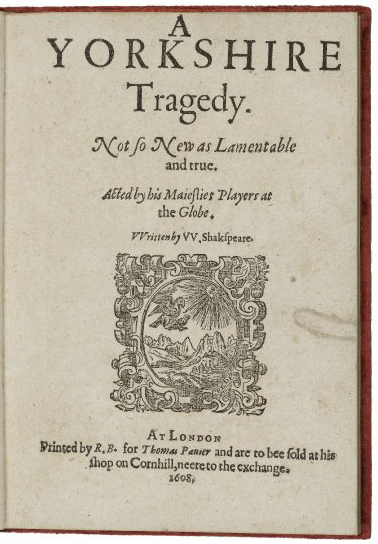 Title page imaged from Folger call number: STC 22340. Image is from the transcribed copy. The authorial attribution to Shakespeare is now not credited.